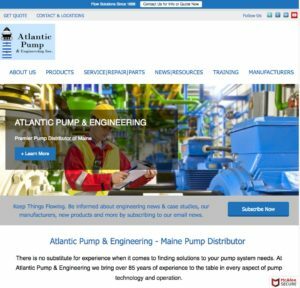 Atlantic Pump & Engineering has launched a new web site to better serve our customers, principals and vendors. Our new site features enhanced product information from our manufacturers, an easy way to request information and quotes, and more. If you are looking for us on social media, visit our Parent Company – Hayes Pump on the sites below. Follow us on Linked In. We will be sharing all the latest business news related to Atlantic Pump here, as well as selected news from the pumping industry in general. Subscribe to our You Tube Channel through Hayes Pump. You will receive all of the latest videos about pumps from us as well as from each of our manufacturers. Follow @HayesPump on Twitter as well. Here you will get our latest updates… in short form of course. Check it all out. And let us know what you think.